Home ›HIF News + Media Releases ›HIF remains very competitive in the market following latest premium increase announcement. HIF remains very competitive in the market following latest premium increase announcement. The Health Insurance Fund of Australia (HIF) remains one of Australia’s most competitively priced health insurance funds following the Federal Government’s premium increase announcement today. While HIF’s latest average annual increase of 6.55% was slightly higher than previous years (4.49% in 2015 and 2.98% in 2014 respectively), historical data shows that when compared to our main industry competitors, our average annual increase over the past seven years has been just 4.68% - the lowest of all key competitors. “Each year we work hard to provide the best value policies for our members and keep price rises down to the minimum necessary. This year’s average increase of 6.5 percent was influenced by a number of factors including the rising cost of healthcare on the back of higher charges by providers, increasing member claims because of the general ageing population, increasing rates of chronic disease, and advances in medical technology. HIF has kept its premium increases low year after year. In both 2014 and 2015, we had the lowest average premium increase of all Australian health funds open to the general public. So, although our percentage increase is a little higher than usual this time around, the years of keeping our increases low means our product prices are still very competitive, as the percentage increase will be coming off a lower base rate. To put this in context, dollar for dollar, HIF members are 6.1% better off compared to the six year average industry increase. Dr David said the costs of healthcare in Australia were increasing across the board as a result of our ageing population, growth in chronic disease, advances in medical technology and higher charges by healthcare providers. For all media enquiries: Please call Donna Cole on 0419 901 229. Want more info? Check out our quick FAQs. Why do premiums go up each year? Each year on April 1, the health insurance industry (all funds inclusive) raises premium rates on existing products. A number of factors lead to these increases, for example: rising health related expenses, increased doctor charges, medical equipment and technology, increases in claims frequency, and more. Why are health costs rising more than the Consumer Price Index (CPI)? The annual health insurance premium increase reflects the rising cost of healthcare overall. The Consumer Price Index only reflects price increases for a pre-defined range of goods including food and clothing, and is currently held down by the falling oil/petrol prices. As CPI does not reflect an increase in private healthcare usage, it simply can’t be compared to a health insurance premium increase. Why is my premium increasing by more than the HIF average percentage? The average percentage increase is an average across all policies, states and territories, but each product is priced individually depending on the increasing health care costs associated with that product in each state or territory. For that reason, some of our rates have gone up less than the average and some more – depending on the costs associated with the particular product or location. This year’s adjustment to the Federal Government Rebate will also result in a reduction of the discount you receive off the price of your policy by the Government. The erosion of the rebate is driven by the Government and is not a decision implemented by HIF. It’s also important to note that the rebate does not apply to any Lifetime Health Cover Loading (LHC), effective from 1/07/2013. How will the premium increase affect me if I’ve paid my contributions in advance? If you pay your premiums prior to 1 April, you will enjoy rate protection for that time, including other changes that may impact your premium after April 1 such as the reduction of the Federal Government Rebate. That means that you will pay your premiums at the current rate for the duration of that upfront payment, which can be 12 months worth of premiums, 6 months, 3 months, 1 month or one fortnight. If you do choose to make an upfront payment of 12 months, you will also receive an additional bonus discount of 4% (or 2% for six monthly payments). Does HIF profit directly from premium increases? I’m an HIF member. By how much will my standard contribution increase and when are the new rates effective from? The exact details of how the premium increase will affect you personally will be communicated to you in writing prior to April 1. I’m currently with another fund but I’d like to switch to HIF. What do I need to do? Switching to HIF is easy as. Simply call us on 1300 13 40 60 or join online (it only takes a few minutes). During the online application process, we’ll ask for the name of your current fund, your previous member number and your authorisation to contact your previous fund on your behalf - then we do everything else! No forms to fill in, no paperwork, nothing. We’ll also honour your previous length of membership, meaning that you receive the highest benefits applicable to your new level of cover, and you don’t have to re-serve any unnecessary waiting periods. How does HIF’s increase compare with other funds? 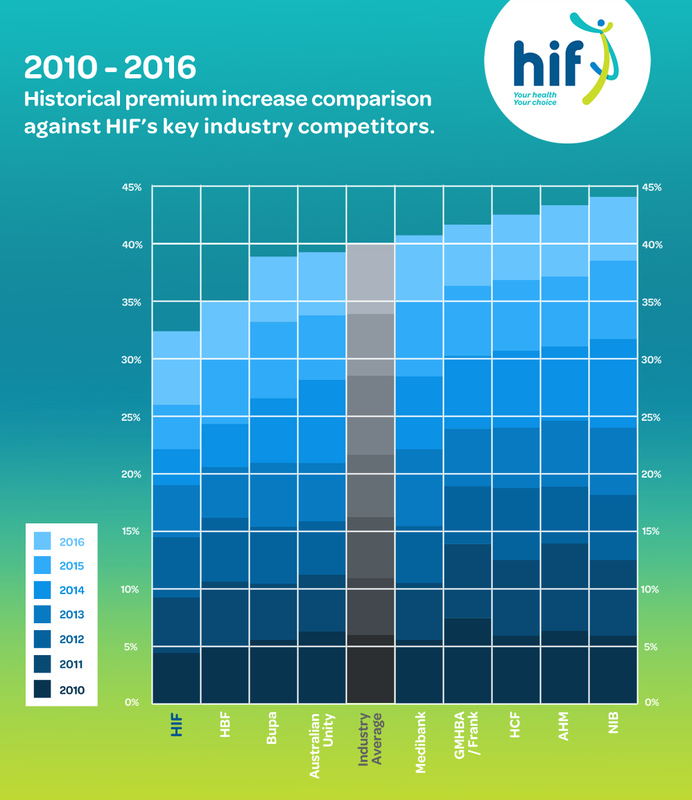 Please refer to the graph below for a seven year comparison against HIF’s major industry competitors. Looking at the data for this year's increase HIF is above the average by almost 1%. That "our average annual increase over the past seven years has been just 4.68%" doesn't really mean you're still offering the best value for money. There seems to be a clear trend of where things are heading - 2014 / 2.98%, 2015 - 4.49% and 2016 - 6.55%. You have gone from very competitive increases to a fund that has some of the highest increases this year. At the current rate of increases I will be looking for a new fund once my current policy expires. Thanks for your feedback and please accept my apologies for any dissatisfaction caused this year. As you noted, HIF's latest average increase of 6.55% is slightly higher than previous years. This is due to factors such as an increasing volume of claims by HIF members (currently 33% higher than the previous year) and the ever-increasing cost of healthcare across Australia. As you’ll see from the graph above though, our historical premium increases over the past seven years have been much lower than the other major funds. Hopefully this will help to reassure you that we're still very competitively priced in the market, as our percentage increase may be higher this year but the actual dollar increase is coming off a much lower base rate. Unfortunately, the rebate reduction is a Government enforced change across all health funds . While we regret having to implement the reduced rebate amount for our members, it's unfortunately not something we have control over. As Australia’s fastest growing not-for-profit health fund, HIF's number one priority will always be our members. That means we don’t have shareholders to consider, so our premiums only ever increase to a necessary level each year to ensure that we can improve our member benefits, cover rising healthcare costs and pay our members’ claims. To put this in context, did you know that HIF paid out $114 million in claims rebates in the 2014/15 financial year? That’s an increase of 27.7% on 2013/14, and just one of the reasons why HIF (like all health funds) have to increase their rates each year. I hope that helps anyway, Ben, but if you have any further questions please don’t hesitate to ask.